Permeable pavement is an alternative to conventional paving in which water filters through the paved structure rather than running off it. Both the surface and the sub-grade need to be designed with this function in mind. Water may infiltrate directly into the subsoil where conditions are suitable. Alternatively, it can be held in a reservoir structure under the paving for reuse, infiltration or delayed discharge. 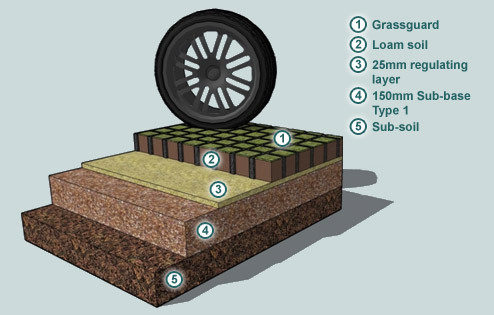 The permeable paving can be gravel, concrete or plastic webbing, concrete blocks designed for the purpose or porous asphalt. Overflows can be constructed on all these systems wherever surfaces must be kept free of water at all times or where the base needs to be sealed to protect the aquifer. Even if the overflow operates, storage and filtering of the runoff water has occurred, and environmental benefits accrue. The overflow can lead into a permeable conveyance system to increase further the benefit and reduce the need for pipe systems. 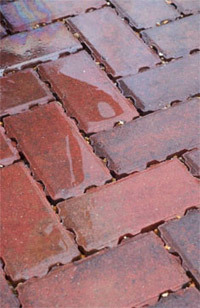 Permeable paving is effective in removing pollutants. High removal rates for sediments, trace metals and organic matter have been reported and a reduction in nutrients has also been measured. Permeable pavements need to be protected during installation from the excessive mud that is usually present on construction sites. Design guidance on permeable pavements is available from CIRIA (5). View sites in Wales with a Permeable pavement system.